Thanks to Stefan for the Stream report and pics! With air temps on the rise the water in the Gunpowder has finally touched the 40 degree mark. Looking at next weeks forecast water temps should climb to the mid forty’s in no time. The river is still flowing quite fast at 150 cfs. Wild ish will start to take little black stone flies off the surface in the slower areas and close to log jams as the river warms Steady subsurface action nymphing with black and red zebra midges and dead drifting streamers has been the ticket. 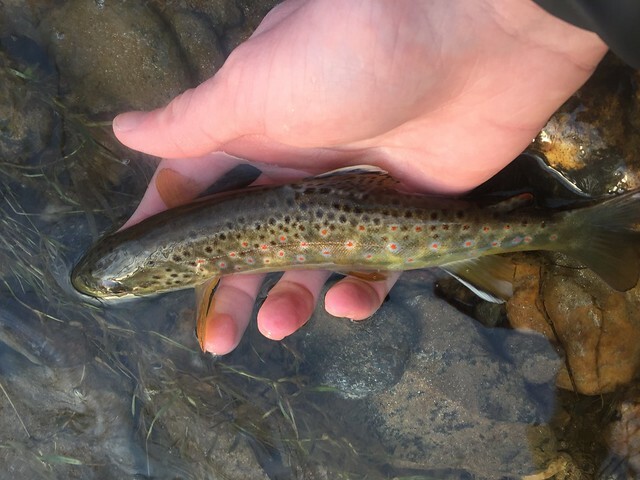 If your planning on fishing the river in the next week or so be sure to stop in the shop and pick up some streamers and an assortment of stone fly patterns. 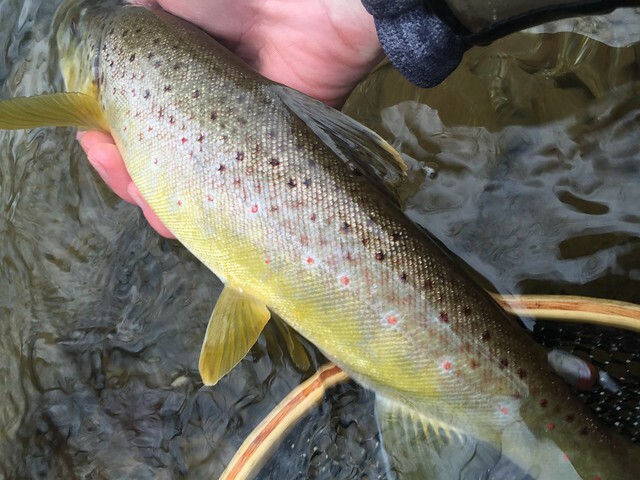 This entry was posted in fishing report on February 27, 2016 by Theaux Le Gardeur. The shop will open at 1:00 PM on Monday the 22nd. Thank you! This entry was posted in news on February 21, 2016 by Theaux Le Gardeur. The shop will be closed today February 18. We will re-open at 10 AM on Friday. Thank You! This entry was posted in news on February 18, 2016 by Theaux Le Gardeur. 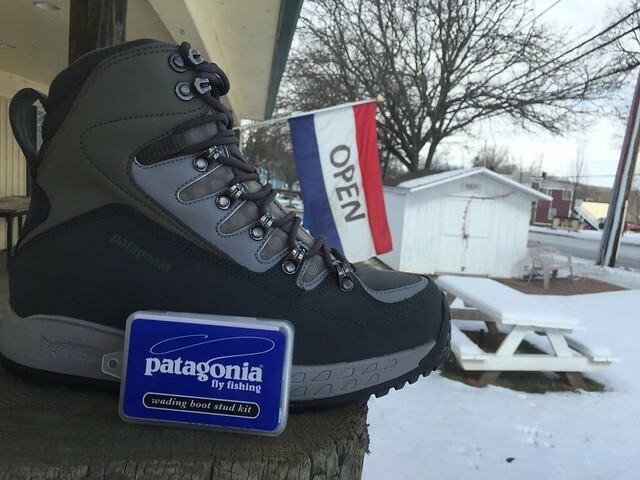 The new Patagonia Ultralightweight II boots are here at $189 and just in time for mid-winter fly fishing! Thanks to Stefan for this great shot of them on the porch overlooking the snowball stand. The original Ultralightweight won the “Best Footwear” award at the European Fishing Tackle Trade Exhibition (EFTTEX) back in 2012. The new boot is now quicker drying with a synthetic leather upper and features a durable Polypropolene insole board and super tacky rock grip soles. Call us at 410-357-9557 to reserve your new pair of lucky fishing boots! Studs are available separately for another $19. If you can’t make it up in the snow we’re shipping priory mail free through FEB. 21st while supplies last. Please be sure to order one size larger than your street shoe. These comfortable sticky rubber wading shoes are extremely light and flexible, while providing stability, durability and foot protection. Boats and trucks can only take you so far; you have to make it the rest of the way to the fish on your own two feet. When the trail gets long, our Ultralight Wading Boots keep a spring in your step all the way there and back. The new, more streamlined synthetic leather upper dries fast, flexes easily and holds up through years of hard use. Durable monofilament mesh drains the footbed while keeping sand and silt out. The external rand, internal support and reinforced toe box protect feet from deep-water pressure and rocky river bottoms. Long-wearing Rock Grip sticky rubber soles hold fin straps, accept studs (sold separately) and can be resoled for extended life. This entry was posted in gear on February 14, 2016 by Theaux Le Gardeur. Snow still blankets ice over the rocky trails along the Gunpowder River after winter storm dropped 32″ of snow in the Hereford Zone during the last week of January. These shots looking upstream and downstream from the Falls Rd bridge were taken at a river height of 2.79 FT and 300 CFs the afternoon before the snow and ice let go. The next day the Gunpowder River bumped up to 4.97 FT and 900 Cfs in the upper catch and release area. 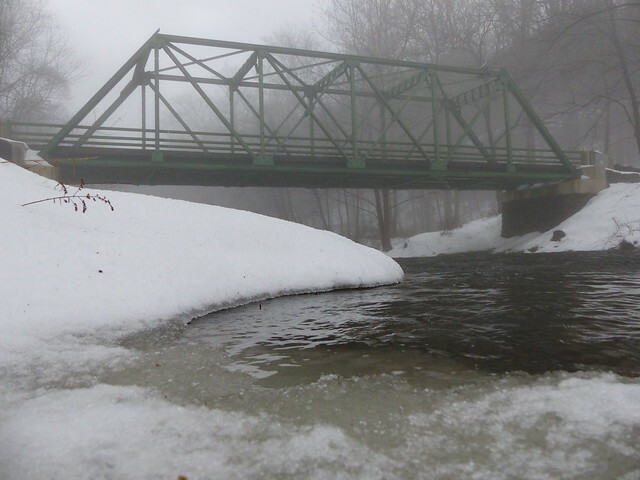 Conditions on the trails are still icy, the river, at present is too high and dangerous to wade fish at 470 Cfs. Before heading out please check the stream gauge or call the the shop over the weekend for the latest updates on conditions. As long as nighttime temperatures stay cold and we don’t lose all the snow at once we’ll be fishing streamers if the river drops below 250 Cfs by late Sunday afternoon. Please note: We just received a shipment of the new Patagonia Ultralightweight II Wading Boots–a sturdier update to our shop favorite. I’m certain that we’ll have time to fit you into some lucky shoes for the upcoming season and well be happy to put in some fresh studs while you wait! 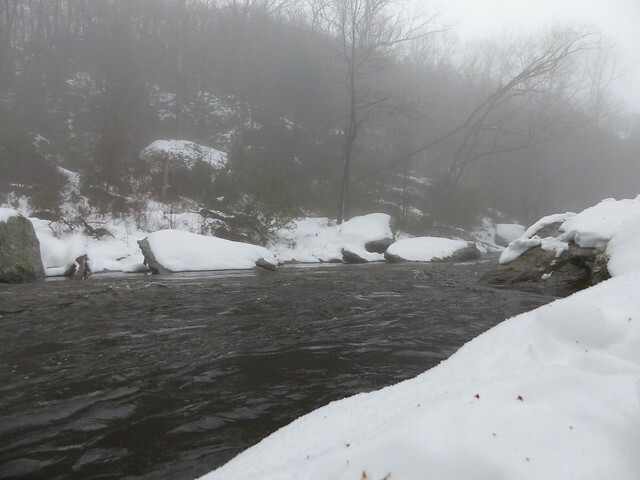 This entry was posted in fishing report, news on February 5, 2016 by Theaux Le Gardeur.